Nowadays our social media are everything. We’re constantly thinking about a witty comment to tweet, we’re on the lookout for picture perfect lattes to post on Instagram and our life events are instantly shared on Facebook. We live in a world where ‘picture or it didn’t happen’ seems to be the norm and preferably that picture is also shared on social media (Silverman). Picture perfect food pics from blogger Song of Style’s Instagram page. But why do we feel the need to share these things with everyone? That has everything to do with self-branding. Originally, branding is a concept taken from the marketing world. Through branding, companies create a recognizable and coherent image so that we, the consumers, can connect with the brand on an emotional level (Hearn 199). In the world of social media not only companies are supposed to worry about a coherent self-brand, but also we, the ‘regular people’ should be concerned with how we’re perceived on social media and make sure that we are an ‘attractive product’ (Hearn 201). Self-branding is intrinsically linked to social media since self-promotion on a wide scale is impossible without an affordable system of distribution (Marwick 298). Users have full control over the information they publish. Therefore, the online self-presentation and -branding is a strategic matter, but it can also be manipulated very easily, losing its authenticity (Kramer & Winter 106). This manipulation of our self-brand happens often on social media: we exaggerate and only show the ‘good’, making honesty hard to find when constructing our online personas. Some take this staging of a perfect self-brand even further. These so called ‘fakesters’ use fake profile information on social networking sites and pretend to be more interesting and successful to impress others (Huang, 417). Self-branding through social media has resulted in the rise of certain niches. ‘Foodies’, ‘fitgirls’, ‘beautygurus’ and ‘fashionistas’ are just a few examples of how one can profile themself online (Watson). Another, very popular, way to manage and influence your online reputation is through the sharing of travel photos. Travel photography is amongst the most viewed content on social media, as is shown by visual media consultancy Chute (Watson). Chute explores what the most used topics are on social media on a monthly base and travelling is always one of them. Last August there were 6.6 million travel photos posted on Instagram only (Watson). Remarkable is that certain types of travel photos are iconic for certain destinations. For instance when posing in front of the Mona Lisa, it is instantly clear that you’re in Paris (Silverman). Another example: in Asia everyone seems to have a photo taken whilst sitting on a swing nearby the beach, as Dutch website Reisjunk playfully points out (Reisjunk). These types of ‘iconic’ pictures are especially easy to stage. Dutch student Zilla van den Born employed these typical pictures in an inventive way and used them to fake a five week trip through Southeast Asia for a school project. She photoshopped herself into versions of these iconic pictures, shared them on her social media channels and made everyone believe she was on the other side of the world. One of the pictures that Zilla edited for her project. We took Zilla’s project as an inspiration to critique the phenomenon of typical travel photos and the extensive appearance of manipulated self-branding and -presentation on social media. To do this we created a mobile application which makes it all too easy to fake a trip abroad. 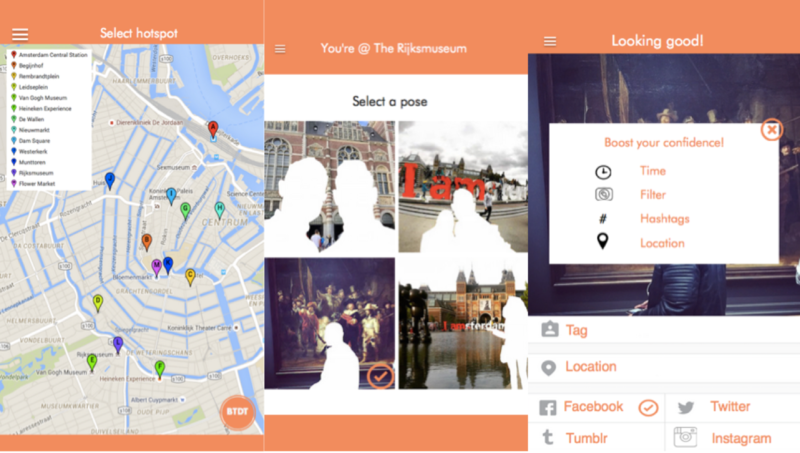 The app allows people to create fake travel pictures and share them on social media. No photo-editing skills are needed at all. With the app, users can brand themselves as travellers through social media, responding to the popularity of ‘wanderlust’ content. The app is named Been There, Done That, reflecting on the phenomenon that most people seem to find it more important to take a photo of their experiences, than to actually ‘live in the moment’. A photo that has gone viral after a movie premiere, because the older woman was the only one enjoying the moment and NOT busy taking a picture of actor Johnny Depp. The idea of the app is that one can, very convincingly, fake a trip abroad and post the most beautiful pictures of this trip on social media channels (for now the options are: Twitter, Facebook, Instagram and Flickr). The app will show the user a world map on which he can select a desired destination. In this beta-version Amsterdam is the only possible destination, but this will change in the future. After selecting his destination the user dives right into the fun part of a trip: exploring unknown territory. He will do this via a map of the city/area he selected. On this map certain places are marked with a vector. These are the places one should visit as a tourist to take the most ‘iconic’ photos. For Amsterdam we based these must-sees on Sander van der Drift‘s extensive analysis of touristic Flickr data (2015). We repurposed this data and determined that one should take pictures at those places to convince people of their trip to Amsterdam. To let the user move beyond the touristic activities we implemented some more maps: the excursions-map and the get social-map. These maps cost $4,99 (a one time fee), but they will make the fake trip appear even more real on social media. When using these maps one can visit Volendam, take a boat tour through the canals, eat local delicacies (stroopwafels, herring etc. ), grab a coffee and go clubbing. Of course he can also visit the Bulldog, the city’s best known coffeeshop. The excursions, bars and hotspots are seasonal and determined by popularity algorithms based on social media data of Amsterdam residents. This way we ensure that the trip contains all the elements of a real-life exiting getaway and at the same time is up-to-date. Three screenshots taken of the Been There Done That-application. The goal of this faux getaway is upping one’s social media game. Therefore we offer lots of tips and suggestions for the social media posts. We tell the user the best day and time to post on social media (through a scheduling option), the best filters to use, the most popular travelling- and local hashtags and we help with correctly geotagging the pictures. We do this with extensive algorithms that process popular travelling content so that the updates of our users will get lots of likes. All the scheduled posts can be viewed and edited in the ‘Your Profile’ section. Here the user can also save the pictures to his phone. To get an exact idea of how the app works: watch this how-to video, try it with our online application and make sure to check out our website! Hearn, Alison. “Meat Mask Burden: Probing the Contours of the Branded ‘Self’.” Journal of Consumer Culture. 8 (2008):197-21. Huang, HanYun. “Self-presentation Tactics in Social Media.” International Conference on Social Science Journal. (2014): 416-421. Kramer, Nicole and Stephan Winter. “Impression Management 2.0. The Relationship of Self-esteem, Extraversion, Self-efficacy, and Self-presentation Within Social Network Sites.” Journal of Media Psychology 20. 3 (2008): 106-116. Marwick, Alice. “Status Update: Celebrity, Publicity And Self-Branding in Web 2.0”. Diss. (Doctor of Philosophy). Steinhardt School of Culture, Education and Human Development: New York University: New York, 2010. Reisjunk. “7 foto’s die iedere backpacker maakt in Thailand”. Reisjunk. 2015. Reisjunk.nl. 15 Octobre 2015. <http://www.reisjunk.nl/reisinspiratie/7-fotos-die-iedere-backpacker-maakt-thailand/>. Silverman, Jacob. “ ‘Pics Or It Didnt Happen’ – The Mantra Of The Instagram Era.” The Guardian. Katherine Viner. 2015. Guardian News and Media. 15 Octobre 2015. <http://www.theguardian.com/news/2015/feb/26/pics-or-it-didnt-happen-mantra-instagram-era-facebook-twitter>. Watson, Monica. “Instagram Analysis Reports: August 2015”. Get Chute. 2015. Chute Corporation. 15 Octobre 2015.<http://blog.getchute.com/insights-outlook/instagram-analysis-reports-august-2015/ utm_source=LinkedIn&utm_medium=LinkedIn&utm_content=VerticalReports&utm_campaign=LinkedIn-Blogpost> .